The composer Jules Massenet is celebrated with an exhibition at the Paris Opera. On the occasion of the centennial anniversary of Jules Massenet’s death, an exhibition is being held at the Paris Opera Garnier. Displayed are Jules Massenet’s reconstructed workshop, his glasses, and an inkwell set on his piano/desk, his manuscripts and opera posters. The exhibition is organized by the Paris Opera in partnership with the National Library of France (BNF). Entitled “The Belle Epoque of Massenet,” to avoid mentioning his first name “Jules” (a name that the composer detested), the exhibition retraces the evolution of this great master. Massenet was born in 1842, in Montaud, part of the Loire region. His family moved to Paris when he was six, where he began studying piano with his father’s second wife. This early training facilitated his acceptance at the Paris Conservatoire at age eleven. Although at first a career in music was not predicted for him by some of his teachers, this changed in 1862 when he won the Grand Prix de Rome for his cantata David Rizzio. There followed three years at the Académie Française, on the Pincio where he met Franz Liszt. At Franz Liszt’s request, he gave piano lessons to Louise-Constance “Ninon” de Gressy, the daughter of a wealthy lady named Mme Sainte-Marie, who became his wife in 1866. In 1872, he stopped composing to serve in the Franco-Prussian war. In 1876, he received the Légion d’honneur, and was appointed a Grand Officer in 1899. In 1878, he was elected a member of the Académie des Beaux-Arts, to the exclusion of Camille Saint-Saëns. He was only 36, the youngest member ever elected to the Académie. A very prolific, hard-working composer (he composed over 25 extant operas, with a daily schedule starting frequently as early as 4 A.M.), he created his pieces not “at the piano” (as so many other composers do), but entirely from his imagination. This ability greatly helped him to achieve his high standards as an orchestrator. Even in his loudest passages, the instrumental texture is always lucid. It is curious that he was also known to avoid all public dress rehearsals and performances of his works; often he would have to be informed by others of his operatic successes. Among his famous works:Werther (inspired by The Sorrows of Young Werther by Goethe), The Cid, Thaïs and Grisélidis, Cinderella, The Juggler of Notre Dame and Cherubim. 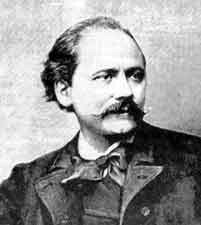 Massenet died in Paris in 1912, at the age of 70, after suffering from a long bout with cancer. Massenet dominated the lyrical operatic life of the end of the 19th century and succeeded in creating, in the words of the exhibition organizers, “a unique synthesis at the theatre of art and music.” He is also said to embody “the French sense of elegance and sensuality.” The reconstructed composer’s workshop has its own special atmosphere. It is particularly moving to see his piano whose lid pivots to transform itself into a desk. Positioned on the piano are the conductor’s baton, glasses and an inkwell. Massenet sources of inspiration indicate influences from the antiquity, the great literary figures as well the exoticism prevalent at the end of the 19th century. His operatic costumes, posters, scenery and interior decoration models were associated with fantasies of opulence, while his musical vocabulary is full of rhythms, melodies, or instrumentation designed to evoke the atmosphere of far-off lands or ancient times. This exhibition is not to be missed for all lovers of opera and visual arts. Opera Garnier Museum-Library in Paris from December 14, 2011 to May 13, 2012.